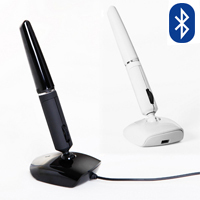 The Penclic Mouse (3rd Generation) provides an effortless and intuitive way to move the cursor with fine precision by employing motions similar to those used when writing with a pen. The pen can freely pivot in a recessed circular depression (ball/socket joint) on the base, allowing the user to find the best angle and orientation of the pen to maximize comfort and precision. The base itself glides to provide mouse control, and the movement of the base is achieved by using the small muscles and joints of the fingers as opposed to the larger muscle groups of the shoulder and arm. As the orientation can accommodate a wide range of positions, the user is able to move the mouse with either fine or gross movements (and accompanying positions) which can help to reduce any one set of repetitive movements. 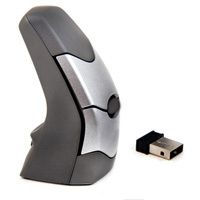 The design of the Penclic Mouse (3rd Generation) is also ambidextrous, enabling the user to easily balance the workload between the left and right hands. A number of improvements were made on this latest Penclic such as moving the scroll wheel onto the pen for easier access and better control. The buttons have also been simplified and are more intuitive and easy to use. 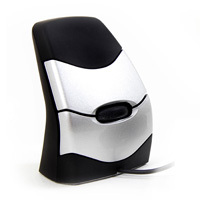 The DXT Ergonomic Mouse 2 from City Ergonomics is a fingertip vertical mouse designed to enable the hand and wrist to adopt a relaxed vertical posture. Control of the mouse is achieved by using the small muscles and joints of the fingers as opposed to the larger muscle groups of the shoulder and arm. Since the fingertips provide much greater precision than the arm, this makes the DXT mouse suitable for users seeking precision and fine control. 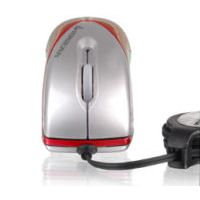 The DXT Ergonomic Mouse 2 features light click buttons to minimize the effort required for clicking. 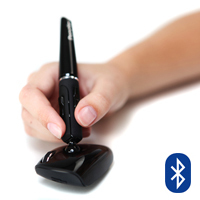 The unique ambidextrous design enables the user to easily balance the workload between the left and right hands. 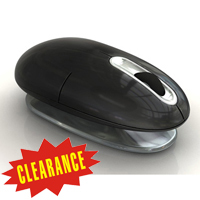 The DXT Ergonomic Mouse 2 moves with minimal resistance, requiring nominal effort to accomplish effective cursor control. 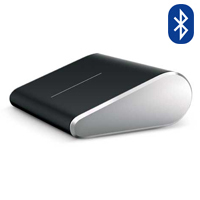 The weighted zinc base provides vertical stability and enhanced tactile feedback. There are four DPI (dots per inch) settings, further enhancing the sensitivity and increasing accuracy when performing fine cursor movements. This also permits the user to have greater control over the speed of the cursor when performing tasks requiring different degrees of control. 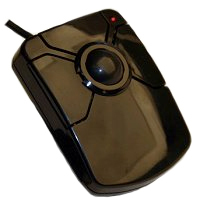 The DXT Mouse 2 is also available in a convenient wireless version. La DXT Ergonomic Mouse 2 par City Ergonomics est une souris vertical 'fingertip' qui est conçu pour permettre la main et le poignet de s'adopter à une position vertical relaxer. Contrôle du souris est atteint par utiliser les petits muscles et joints des doigts plutôt que du groupe des plus gros muscles de l' épaule et le bras. Puisque les bouts des doigts permet beaucoup plus de la sensibilité, contrôle, et information tactile que le bras, cela fait la souris DXT appropriée pour utilisateurs qui veulent le mouvement précise et plus fine. Les boutons sur la DXT Ergonomic Mouse 2 sont léger pour diminuer la force nécessaire pour faire un clic. Le design unique est aussi ambidextre, qui vous permet de facilement balancé le travail entre la main gauche et droite. La DXT Ergonomic Mouse 2 bouge avec de la résistance minimal, ce qui exige l`effort nominal pour obtenir le mouvement du curseur efficacement. La base est alourdie de zinc qui améliore la stabilité du position vertical. Cela améliore aussi l'information tactile. Il y a quatre paramètres de PPP (Points Par Pouces- aussi connu par DPI), qui en tourne renforce la sensibiliter et augement la précision durant la performance du mouvement précis. Cela permet l`utilisateur d`avoir encore plus de controle de la vitesse du curseur durant les tâches qui exigent avoir différentes degrés de controle. La souris DXT Ergonomic Mouse 2 est aussi disponible en modèle pratique wireless.